Make your helmet your mini stereo system – these extremely light headsets can easily be installed into 3/4, full face, or modular helmets. 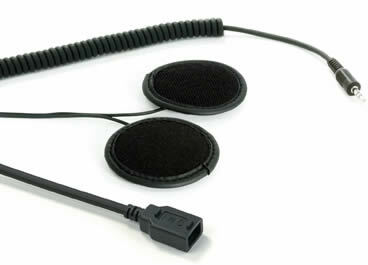 The kit includes a two piece connector for listening to stereo audio sources. No microphone is included in this kit, however it is perfect for music players (ipod, iphone mp3 players) and GPS systems (Zumo 550). The end plug is a 3.5mm stereo plug. •	Flat panel speakers with metal casings provide great range of sound for music and loud and clear audio. •	Connector: 3.5mm connector for most MP3, GPS, Satellite Radio Players etc.